Based off of the official Kirby Super Star Ultra game artwork. I'm aware that it doesn't look exactly like the official one, but I tried, and I'm happy how it came out. OK, as much as I think the Sword ability is overrrated, this IS awesome. 5/5 for you. hey it's marx01 from the forums! you're a great artist!I can't wait to post art to!! If any ability needs more love, it's hammer. King Dedede came before Meta Knight and Sword, and he's been in more games than them. Since it's obvious that he inspired Hammer, I would like it if hammer was used more often. 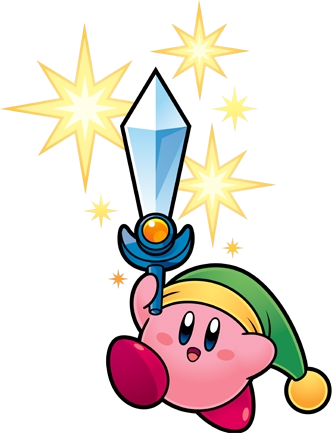 oh, and a Hammer Waddle Dee and Sword Waddle Dee would be awesome. Especcialy in the ffact that i wouldn't have to look at Sword and Blade. THAT IS SO MUCH LIKE THE ORIGINAL! 5/5! Heheh... 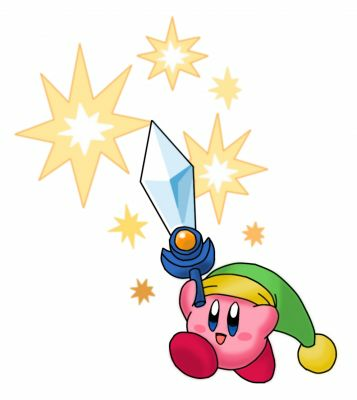 The sword is bigger than li'l Kirby!